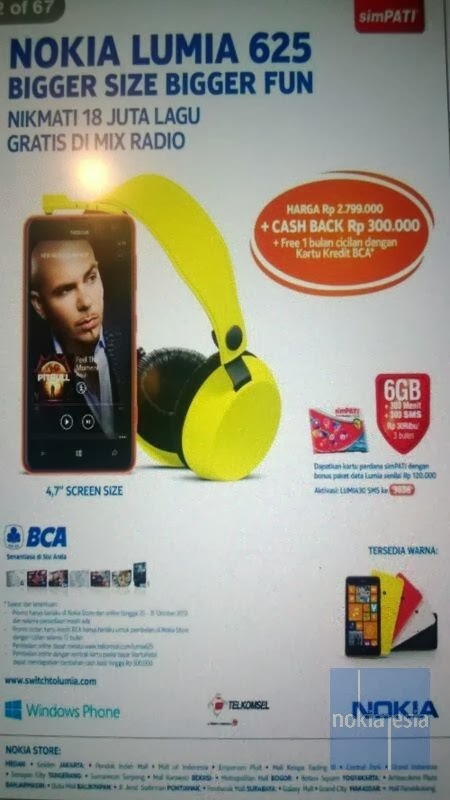 Good news for Nokia Lumia 625 hunter, Yap Start tomorrow, Friday 25 October 2013, Nokia Lumia 625 will be sold in Indonesia with special price and interesting cash back and free 1 month installment (free 1 month installment is valid only for BCA Credit Card holders). The official Price of Nokia Lumia 625 is IDR 2.799.000. From 25 October 2013 until 31 October 2013, you will get IDR 300.000 Cash back. If you are BCA Credit Card Holders, you also can get free 1 month installment promo.